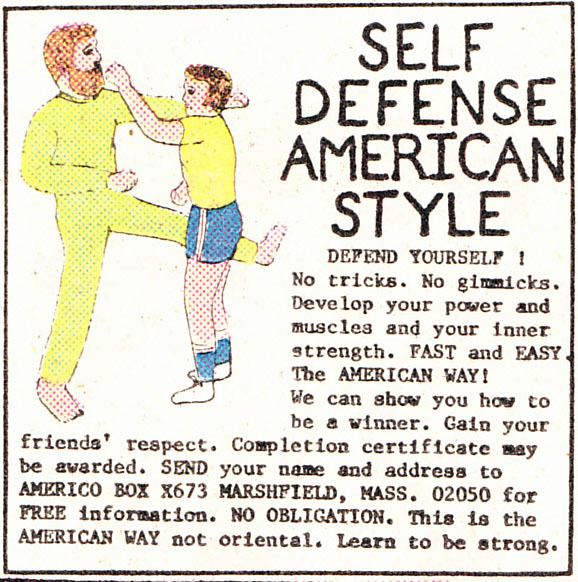 Who needs a collections of fast, athletic moves when you can simply deliver a poorly drawn left-handed punch to the bearded face of a man in a yellow onesie? Is there anything more American than that, my friends? My initial thought was the guy in the yellow onesie was the American, ’cause he looks like he’s kicking the kid in the nuts, and beating up a kid with a cheap shot like that seems pretty American. But I guess it is supposed to be encouraging kids to learn the proper arts of fisticuffs. Punch bearded men in the face, ’cause they’re probably hiding Communist propaganda in that facial hair! Damn it, my hiding place has been discovered!